Servants In Ecuador: This is why I LOVE my job! Why do I love being a missionary in Loja city so much? Because, where else in the world would THIS happen??? My parents have finally arrived in Loja. 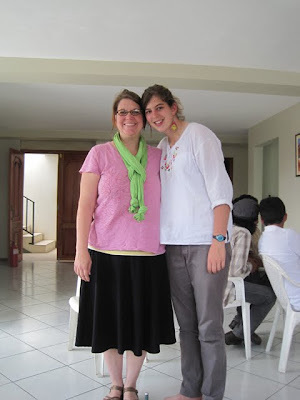 They live in an apartment in the Loja Ministry Center, where the school they will be teaching is located. They have been hard at work setting up the school and the children's library. Last night, I was helping them. "Do you hear someone hammering?" my dad asked. A few minutes later he said he was sure he heard someone hammering inside the building. Knowing that we were alone, we told him he must imagining things. But, he wasn't hearing things. What he heard was a young man, pounding (for several minutes) on the front door. This young man was insistent that someone answer the door. He was at the wrong door. He wanted the radio station, and I told him that he needed to go next door to where the radio station was. "But no one is there." he said. I explained again that the building he was at was NOT the radio, but this young man was so insitent that the door upon which he knocked WAS indeed the radio, that I decided to step out into the rain and walk him over to the radio myself. My dad, who had answered the door, followed me. The radio was almost completely closed up. The shutters had been pulled, but I rang the bell. "Who is it that you need to talk to?" I asked. He mumbled that he just wanted to talk to someone at the radio. "I don't think anyone is here." I told him. "I need to talk to someone at the radio." he said again. I rang the bell again, and someone came to answer. It was a young woman, alone, closing up the radio. It was not who he wanted to talk to, but this young woman worked and talked until finally she got him to tell her that it was a pastor he was seeking. He had heard that there were pastors at the radio he could talk to. This young man was in obvious distress but was told he would have to return in the morning. But not without prayer! "My sister and I want to pray with you." the young woman told him. And right there, on the sidewalk, in the street, in the rain, three people, strangers, laid hands on this young man and prayed for him. Our prayers were fervent enough to draw attention from people walking by. They stopped to listen, moving on only we we had finished. But- during that prayer, God sent me an idea! Because God does that! EL SENDERO HAS A PASTOR! So, after a bit of explanation, Dad and I decided to walk him down to the cafe to talk with David Ludeña. Half way to the cafe, my phone rang. It was David, calling me. "Can you come to the cafe?" he asked. "There is someone here who needs your help." "Well, David, I am on my way, and I am bringing you someone who needs YOUR help!" Coincidence? NO WAY people, NO WAY. God had been orchestrating this evening from the very beginning. When we arrive at El Sendero, I made introductions and David went to council the young man. Huberto had come to receive help with his English. Huberto is a young man that Dustan has been building a relationship with and Umberto faithfully comes to Dustan's Bible study every time he is in the city. English was how we started our relationship, but it has since moved on to sharing our faith with him. Oh, you remember her. She was a an exchange student from Belgium. I included her in my prayer letters for months. She has been gone for close to a year, but is back in Loja and came by the cafe to visit. Dad agreed to help Umberto (which gave him the opportunity to begin a new Ecuadorian relationship) and I embraced Maude like she was a long lost friend. Three opportunities for ministries. A hundred opportunities for all three to be missed. We could have ignored the door. He could have left earlier. We could have told him to come back in the morning. We might have sent him on his way without praying for him. We might have sent him to El Sendero on his own. Dad could have decided to stay at the Ministry Center to continue helping mom. Ministry happens when God sends the people, when those people hear the door and decide to answer it, AND when His people take action! After all that, Dad and I danced home in the rain, so grateful for the excitement, the blessing, and the chance God gave us to be His tools in Loja, His service to three young people last night. Pray with someone in the street today. Embrace someone as if they are a long lost friend, because you know connection is vital for the sake of the Gospel. Go with someone to get help. Answer your door. There are people knocking. Maude and I at her going away party last year. Thank you for the reminder that most ministry happens when we allow God to step into our life and interrupt our plans. His plans are so much better. Thank you so much for this blog. I have been having doubt with God lately which I am ashamed to admit. When you blog things like this I realize I am so wrong for doubting God at all. I am also so proud of you, your family and your parents for doing the things you all are doing. What a great story. Thanks so much for sharing Becka. Maude is back! Maude is back! Hooray! Oh please, please, please, give her a big hug and smooch from me. Tell her I am wearing her beautiful colored shirt today and praying for especially for her. I know that God has a plan for her life and I am excited to see it unfold. I love you Becka. I miss you. Tanya~ All of Loja is rejoicing to have Maude back. She told me she can't even walk anywhere without having people shouting at her and giving her hugs. And believe it or not- that girl GREW. She is even taller!